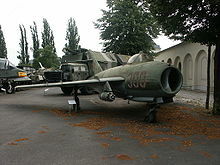 The Lim-6 was a Polish attack aircraft used between 1961 and 1992 by the Polish Air Force. It was a variant of the Mikoyan-Gurevich MiG-17/Lim-5 (NATO reporting name Fresco). In 1955 Poland bought a licence for manufacturing the Soviet MiG-17, the basic jet fighter of Warsaw Pact countries. It was given a designation Lim-5 in Poland (an abbreviation of: licencyjny myśliwiec - "licence fighter"). The first Lim-5 was built in WSK-Mielec on November 28, 1956, replacing in production Lim-2 (MiG-15bis). By production's end in 1960, 477 Lim-5s were built, becoming Poland's basic fighter. In this number, there was also a number of reconnaissance variant Lim-5R, with AFA-39 camera. From 1959 there was produced also a licence interceptor MiG-17PF, equipped with the Izumrud-5 (RP-5) radar, named Lim-5P. By 1960, 129 were built. In the late 1950s work commenced in Poland on developing a light attack aircraft based on the Lim-5. The basic MiG-17 and Lim-5 could carry only two 250 kg bombs, instead of underwing fuel tanks. After building some prototypes, designated 'CM', the Poles began production in 1960 of an attack aircraft Lim-5M. It introduced several modifications to the fighter, mostly in order to enable basing on ground airfields. It had double undercarriage wheels, braking parachute and attachments for RATO. Most noticeable were additional fuel tanks in thicker wing sections close to the fuselage. Instead of two bombs, it could carry two launchers for eight 57 mm rockets S-5. By 1961, 60 Lim-5M's were built and from November 1961 given to the Polish Air Force. They were not successful; thicker wings with fuel tanks decreased their performance and made flying tricky, while the range was not increased due to drag. The Lim-5M was regarded only as an interim variant, and works upon more advanced plane continued, testing many different ideas. In 1961, 40 attack aircraft Lim-6 were built. They introduced new blown flaps, but tests showed problems with the modified Lis-6 jet engine and the aircraft were not given to the Air Force. As a result, it was decided to redesign the thick wing sections with fuel tanks, blown flaps, double wheels and RATO and return to only slightly modified Lim-5 construction, with increased weapon-carrying capability instead. In 1963 the Poles started production of the final variant of an attack plane, Lim-6bis. It had standard wings and single wheels, like the Lim-5 fighter. One important change was adding two underwing weapon pylons, close to the fuselage. Another change was adding a braking parachute container below a rudder. From 1963, these aircraft started equipping the Polish Air Force, but it was officially accepted only on September 14, 1964. By 1964, there were built 70 Lim-6bis, and a number of Lim-5M and Lim-6 were rebuilt to Lim-6bis standard. A number were also made in a reconnaissance variant Lim-6R (or Lim-6bisR) with AFA-39 camera under a fuselage. As Lim-5P fighters became obsolete, from 1971 they were also rebuilt to Lim-6bis standard, designated Lim-6M. Their radars were removed, but there remained radar covers in central air intake. They were fitted with additional underwing pylons, but not with a braking parachute. Some aircraft were modified to a reconnaissance variant Lim-6MR. 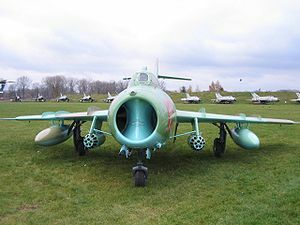 The Lim-6bis was armed with two NR-23 23 mm cannons (80 rounds) and one N-37D 37 mm cannon (40 rounds), like MiG-17 (the Lim-6M was probably armed with three NR-23 23 mm cannons, like MiG-17PF). It had four underwing pylons. Typical armament were two launchers Mars-2 (Polish-made) for 16 unguided 57 mm rockets S-5 each, or 100 kg bombs. It could also carry 250 kg bombs or launchers on standard outer underwing pods, but usually they were used for 400l fuel tanks. Lim-6bis, 6R, 6M and 6MR were used by the Polish Air Force, as most numerous attack aircraft, until the 1980s. The last were finally withdrawn in 1992. Some were exported to the East Germany (GDR), Egypt and Indonesia. Some ex-GDR machines found themselves in Guinea-Bissau in the 1980s. Day-fighter (licenced MiG-17F) (serial numbers: 1C 00-01 to 1C 19-14). All-weather interceptor (licenced MiG-17PF) (serial numbers: 1D 00-01(?) to 1D 06-41). Attack aircraft (serial numbers: 1F 01-01 to 1F 03-30). Experimental attack aircraft (serial numbers: 1J 04-01 to 1J 04-40). Basic attack aircraft (numbers 1J 05-01 to 1J 06-40). Attack aircraft, conversion of Lim-5P. Reconnaissance aircraft, conversion of Lim-5P. PZL-Mielec Lim-6 Pictures and PZL-Mielec Lim-6 for Sale.